What sacrifices we make, let them be sacrifices that transform us. They are not ends in and of themselves. They are tools by which we can become a little closer to God's image, a little closer to Christ's life. The purpose of the Bell-ringing ministry is to ring the Church bells at the appropriate times throughout the Divine Services. The bells announce the beginning of the services, proclaiming the gospel through their joyous, heavenly-like sound; they call the Church to prayer and worship. 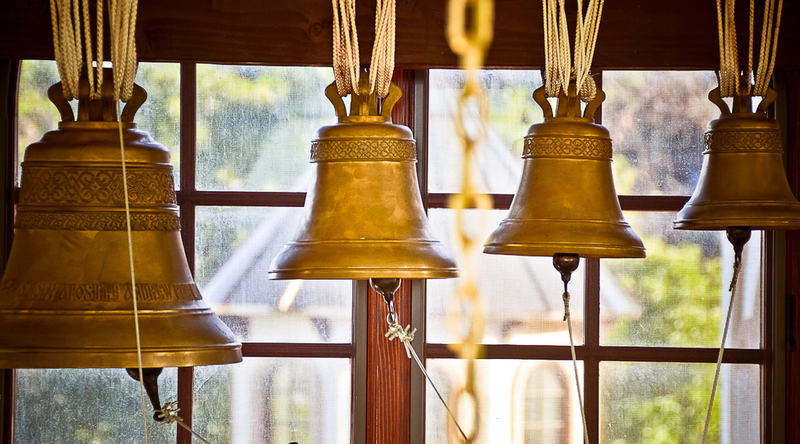 Bells are sometimes referred to as "singing icons" because they establish the acoustic space of an Orthodox temple just as painted icons and hymnography define its visual and noetic space, respectively. The use of bells is symbolic of the proclamation of the Gospel. St. Andrew combines the use of bells with the striking of a wooden semantron, with the semantron being sounded first, then the bells being rung later. The quieter and simpler sound of the semantron is understood to symbolize the Old Testament prophets, for it is the symbol only of a coming event, whereas the ringing of the bells is spread far into the air symbolizing the annunciation of the Gospel throughout the world. St. Andrew has a Typikon for how and when the bells are rung. These rubrics generally follow the Slavonic Tradition of ringing, though not exclusively. The bells at St. Andrew were forged in Russia. St. Andrew hopes to purchase additional bells in the future for sounding “tolls”. Should you wish to be trained in bell ringing or sponsor the purchase of a bell/s please contact the church office.